Ever walk into a store and eye a piece that you physically cannot walk away from? 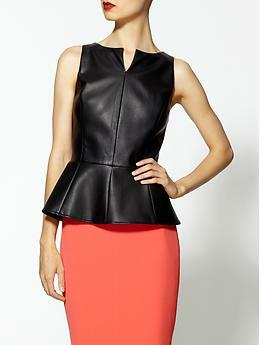 That's what happened to me when I spotted this leather peplum number by Rebecca Minkoff. It's like the thing developed a gravitational pull that would not let me go. And then as if the stars had aligned, I happened upon THIS just-as-cute-but-much-more-affordable version from Piperlime. Naturally, as any Pro Justifier would do, I took it as a cosmic sign that I must own this top. And bought it. I can't wait to pair this top with pencil skirts for daytime and jeans and printed pumps for nighttime. Which top would you buy? Crave or save? Love the second peplum! So gorgeous.